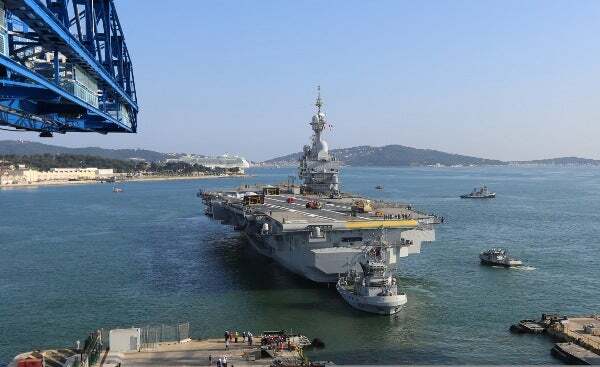 DCNS has completed a six-month intermediate refit programme on the French Navy’s nuclear-powered aircraft carrier Charles de Gaulle (R91), at a shipyard in the Vauban dry dock at the Toulon naval base, France. In September 2012, the French Navy awarded a €221m fleet support service (SSF) contract to DCNS to provide through-life support services for the aircraft carrier over the next four years to ensure operational availability of the vessel. Performed as part of the French Navy’s SSF programme, upgrades to the vessel involved replacing the ship’s stabilisation computer, a complete refurbishment of one of the main galleys and an installation of cabling for a planned IP network. The company also inspected, overhauled and tested the propulsion system and other shipboard systems and equipment to ensure optimal performance. "Upgrades to the vessel involved replacing the ship’s stabilisation computer and a complete refurbishment of one of the main galleys." DCNS Group Charles de Gaulle programme manager Franck Bouffety said the six-month period of intense maintenance and modernisation period will ensure the ship returns in an ‘as new’ condition. "Other teams will now resume shore-based day-to-day monitoring of the ship’s systems and equipment," Bouffety said. Launched in May 1994 and commissioned in September 2000, Charles de Gaulle has been designed to operate a fleet of up to 40 aircraft, which include Dassault Rafale M with a range of 3,340km and Dassault-Breguet Super Etendard carrier-borne strike fighter aircraft. The 261.5m-long and 38,000t carrier vessel features a suite of radar sensors, Thales DRBJ 11B 3D long-range air search radar, the DRBV 26D Jupiter medium/long-range air search radar and DRBV 15C Sea Tiger mk2 air and surface search radar. Capable of cruising at a speed of 27k, the aircraft carrier has a beam of 64.36m and is armed with a surface anti-air missile system and eight Nexter 20F2 20mm guns. Image: French Navy’s Charles de Gaulle aircraft carrier at a shipyard. Photo: courtesy of DCNS.